Father of fallen IDF soldier says government broke the 'covenant' between army and soldiers by failing to return his son's remains. Arutz Sheva spoke with Simha Goldin, father of the fallen IDF soldier Hadar Goldin, at a Talmud learning event in honor of his son Hadar and a second fallen soldier, Oron Shaul. The event included religious leaders and others learning Talmud in the hopes that it will bring the soldiers back to Israel and bring the fight to bring them home to light. Hadar and Oron were both killed during Operation Protective Edge four and a half years ago, in the summer of 2014. 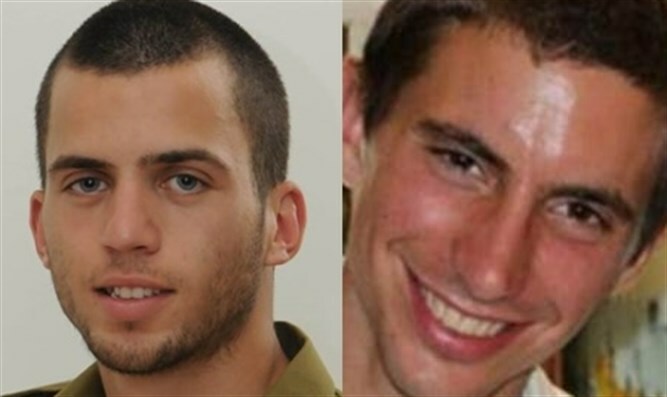 The remains of both soldiers have been held by the Hamas terror organization in Gaza since their deaths. “Everyone is with the Goldin and Shaul families to bring back our children to be buried in Israel,” Goldin explained. When asked about the prime minister's failure to secure the return of the soldiers' remains and the upcoming legislative election, Goldin said, “[Netanyahu] has the time now to correct it. Any leader in Israel, any leader, religious leader, any leader of government needs to know that when they go to war and take those soldiers to war, they have to bring them back. When asked if he thinks things will change after almost five years, Simha Goldin has no doubt that things will change. “Now we are talking with the religious leadership. The Rabbanim (Rabbis) in Hesder. (Israeli program that combines Yeshiva and Military service). Their students, their children are going to the army.